represents the variance of the normally distributed random variable. A distinctive feature of a normal distribution is the probability (or density) associated with specific segments of the distribution. The normal distribution in the figure is divided into the most common intervals (or segments): one, two, and three standard deviations from the mean. 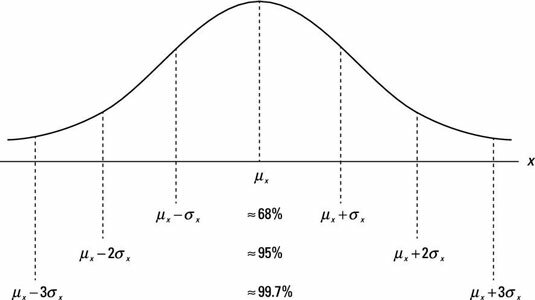 With a normally distributed random variable, approximately 68 percent of the measurements are within one standard deviation of the mean, 95 percent are within two standard deviations, and 99.7 percent are within three standard deviations. If you randomly select one person from this population, what are the chances that he or she is more than 76 years of age? (notice that 6 is equal to two standard deviations). The remaining 5 percent are individuals who are less than 64 years of age or more than 76. Because a normal distribution is symmetrical, you can conclude that you have about a 2.5 percent (5% / 2 = 2.5%) chance that you randomly select somebody who is more than 76 years of age. If a random variable is a linear combination of another normally distributed random variable(s), it also has a normal distribution.